While on set last week with Fossil, I fell somewhat madly in love with the idea of pairing great watches and bracelets. Basically I was having way too much fun with the whole arm party/candy phenomenon. Yes, this is a trend that has carried through until 2015. In fact, I see no end in sight when it comes to us stacking bracelets and watches as if our lives depended on it. 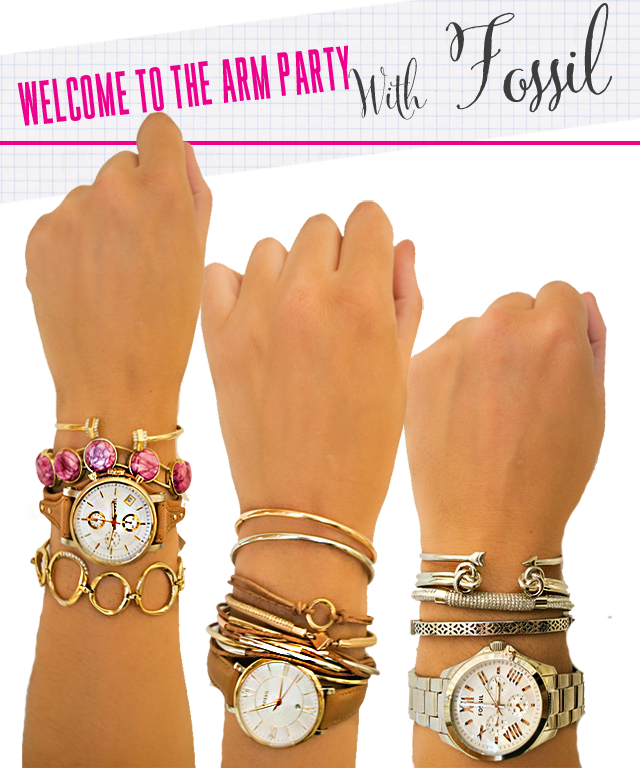 So, I thought I'd put together a little rule book on how to create the perfect arm party with arm candy. Translate that to read, how to put together the perfect stack of bracelets for your arm. Rule #1: Don't be afraid to mix metals. Stacking isn't designed to be too uniformed. The idea is to show off your kit while also taking into consideration the way in which each piece compliments another. Mix golds and silvers without hesitation. The more variety the better. Rule #2: A colour pop can change the game. I'm a massive fan of colour popping in all walks of life. But, when it comes to a bit of stacking I find it nearly impossible to step out without some sort of colour standing tall. I'm obsessed (as you can see by the pinch of pink above). Rule #3: "Too much" is a phrase you will never ever use when stacking bracelets. Just take one look at the blog Advanced Style and you'll know that more is better. Yes, more is better! Let your arm act as armour and cover it from wrist to elbow. Go to town! Express yourself, as Madonna would say. Rule #4: Take them off occasionally. I'm going to be a bit personal here, ladies and gents, when it comes to hygiene. I'm all for arm candy and parties galore, but when it comes to cleanliness with this stacking, some people miss the mark. You do have to take them off occasionally to keep things in check. Yes, I've met people who pride themselves on wearing the same arm candy 24/7 for a year. Not good - for your skin or your scent! Change it up. Remember this is an expression just like your daily outfit - it's good to refresh daily! Rule #5: Make sure you have a watch you absolutely adore and will want to wear every day of the week alongside your arm candy. Here's where Fossil comes in. Yes, every single piece of jewellery I am wearing above is from the brand. But I feel like, when it comes to their watches, these guys can't be beat. I feel like I am rediscovering an old friend. A brand I used to love as a teenager has reentered my life as an adult and they've completely transformed themselves, as have I. It's a renewed match made in heaven and it's worth you taking a look at the brand. Trust me on this. Head on over to Fossil online to check out the full collection of watches and jewellery available this season. My promise to you is that you will have your socks knocked off and will be pleasantly surprised at the more than reasonable prices.